After having eggs benedict in Napa that had jalapeños in the hollandaise, I wanted to try and attempt making it myself at home. So, I found a basic eggs benedict recipe and made it my own, by adding pickled jalapeños! Scroll down for the recipe! Hollandaise: Vigorously whisk the egg yolks and lemon juice together in a stainless steel bowl and until the mixture is thickened and doubled in volume. Place the bowl over a saucepan containing barely simmering water (or use a double boiler,) the water should not touch the bottom of the bowl. Continue to whisk rapidly. Be careful not to let the eggs get too hot or they will scramble. Slowly drizzle in the melted butter and continue to whisk until the sauce is thickened and doubled in volume. Remove from heat, whisk in cayenne and salt. Whisk in jalapeños. Cover and place in a warm spot until ready to use for the eggs benedict. If the sauce gets too thick, whisk in a few drops of warm water before serving. 1. Brown the bacon in a medium skillet and toast the English muffins, cut sides up, on a baking sheet under the broiler. 2. Fill a 10-inch nonstick skillet half full of water. Add white vinegar to the cooking water. This will make the egg white cook faster so it does not spread. Bring to a slow boil. Gently break 1 of the eggs into the water taking care not to break it. Repeat with remaining eggs. Reduce the heat to a gentle simmer. Cook 3 1/2 minutes until the egg white is set and yolk remains soft. Remove with a slotted spoon, allowing the egg to drain. To assemble: Lay a slice of Canadian bacon on top of each muffin half, followed by a poached egg. Season with salt and pepper. 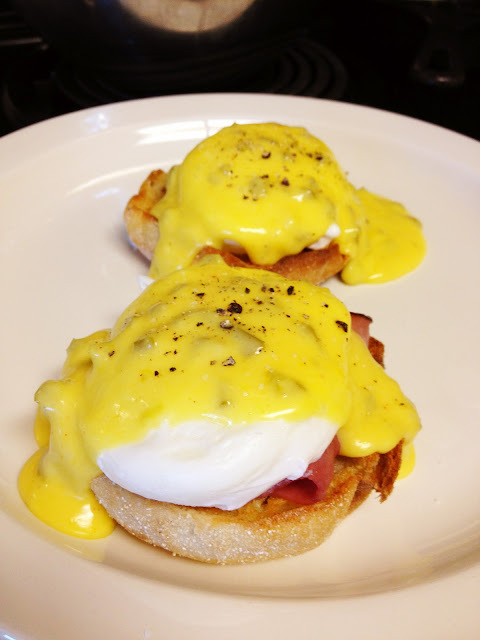 Spoon hollandaise sauce over the eggs. Garnish with chopped parsley. 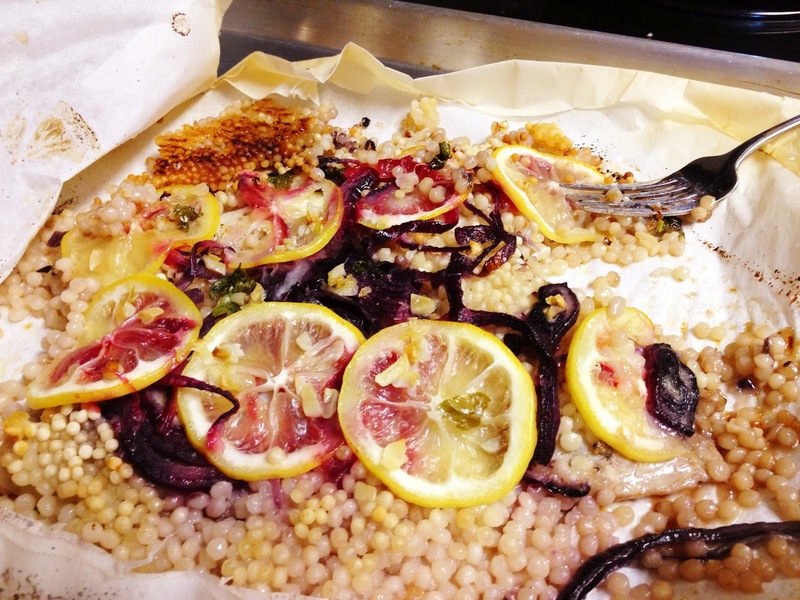 For dinner, I made a red snapper steamed with couscous in a parchment bag. It was a very easy and simple recipe, and although I would change a few things, it was very good. Perfectly cooked, and the steamed package is easy to clean up as well. 2. Rinse couscous in fine mesh strainer, under cold water, lay out on parchment lined baking sheet and sprinkle with pinch of salt (make sure to rinse it no matter what! I didn't and ended up with some crispy couscous). Set aside. Cut parchment paper into 15 by 48-inch sheet. Fold in 1/2 and lay on baking/cookie sheet. Unfold and lay snapper diagonally on sheet pan on top of 1 layer of parchment. Salt and pepper fish, inside and out. Place herbs inside cavity of fish along with 1/2 of lemon, and 1/2 of red onion. Arrange couscous next to fish on all sides. Put garlic, and remaining lemon and red onion on fish and lay tomatoes and artichoke hearts around outside of couscous, creating somewhat of a wall. Pour wine over fish and dot with butter. Fold over edges of parchment paper, stapling if necessary, to create and almost airtight seal. Bake in oven for 30 minutes. Carefully open and serve (be aware of bones in the fish).